On 7/21/18 at approximately 3:45am this suspect broke into Ducky’s Car Wash on WJB. If you have any information about the suspect in this case, please contact Detective Stephen Davis at 979-209-5394 or Crime Stoppers at 979-775-TIPS. Refer to case# 18-0700770. On 11/30/17 a burglary of motor vehicle occurred at Camber Villas Apartments. If you recognize these persons of interest or the suspect vehicle please contact Detective Daniel Amaya at 979-209-5324 or Crime Stoppers at 979-775-TIPS. Refer to Case# 17-1200179. On 12/3/17 a gas can was stolen from the bed of this truck. If you have any information on the suspect in this case, please contact Detective Daniel Amaya at 979-209-5324 or Crime Stoppers at 979-775-TIPS. Refer to Case #17-1200123. On 9/22/17 a stolen gift card was used at Walmart. If you recognize these persons of interest please contact Investigative Assistant Nani Santos at 979-209-5320 or Crime Stoppers at 979-775-TIPS. Refer to Case #17-1000089. On 9/11/17 at 1:30 a.m. these two suspects broke into Daylight Donuts and Briarcrest Cleaners on Boonville Rd. If you have any information about these crimes please contact Detective Chris Cox at 979-209-5317 or Crime Stoppers at 979-775-TIPS. Refer to Case# 17-0900421. On November 3, 2017 at 11:30 p.m. Officers responded to an aggravated robbery that had just occurred at the Town and Country, located at 1401 N. Texas Ave. Two suspects entered the store. One male displayed a firearm and demanded money. The two suspect fled on foot with an undisclosed amount of money. No one was injured. Between 6/07/17 and 6/15/17 a stolen credit card was used to make several purchases at various convenience stores. If you recognize these persons of interest please contact Investigative Assistant Nani Santos at 979-209-5320 or Crime Stoppers at 979-775-TIPS. On 7/30/17 a fraudulent check was passed at Lowes for $1600. The victim lives in Lake Jackson. If you recognize these two persons of interest please contact Investigative Assistant Nani Santos at 979-209-5320 or Crimestoppers at 979-775-TIPS. Refer to Case# 17-0800322. On 4/1/17 a purse was taken from the Walmart on Harvey Mitchell Pkwy. If you recognize these persons of interest please call Det. Beau Wallace at 979-209-5455 or Crime Stoppers at 979-775-TIPS. Refer to case #17-0400034. On 2/23/17 at 1:30am the Bryan Food Mart was broken into. If you recognize these two suspects please contact Detective Beau Wallace at 979-209-5455 or Crime Stoppers at 979-775-TIPS. Refer to case #17-0200949. On 8/24/16 a theft occurred at Walmart on Harvey Mitchell. If you recognize these persons of interest please contact Investigative Asst. Tina Balderas at 979-209-5310 or Crime Stoppers at 979-775-TIPS. Refer to case #16-0801037. On 8/17/16 at 9am two suspects break into a locked vehicle in the Planet Fitness parking lot. If you recognize these two or have information about this crime contact Det. Beau Wallace at 979-209-5455 or Crime Stoppers at 979-775-TIPS. Refer to Case #16-0800700. On 8/12/16 Officer took a burglary of motor vehicle report where someone attempted to use the victim’s credit card at Walmart a short time later. If you recognize this person of interest please contact Det. Beau Wallace at 979-209-5455 or Crime Stoppers at 979-775-TIPS. Refer to case #16-0800500. On 8/8/16 multiple fraudulent charges were made to a debit card at Walmart and a gas station. If you recognize this person of interest please contact Inv. Valerie Hubbard at 979-209-5320 or Crime Stoppers at 979-775-TIPS. Refer to case #16-0800706. Between August 22, 2016 and August 28, 2016 Officers have responded to four home burglaries that have occurred while residents were at home sleeping. The suspect(s) are entering through unlocked doors or windows in order to take cash and cell phones. At this time there have been no attempts to assault or harm residents as the suspects are attempting to leave without waking the victims. Three of the four incidents reported seeing one male and the fourth advised there were two male suspects. The burglaries have occurred after midnight in the early morning hours on Tee St, Sulphur Springs, Lynn Dr. and Ehlinger Dr.
On 6/24/16 a person attempted to purchase merchandise with fake money. If you recognize this person of interest please contact Det. Matt Miller at 979-209-5326 or Crime Stoppers at 979-775-TIPS. Refer to case #16-0600996. On 8/13/16 at 5:50am two males robbed the HIllcrest Grocery at 2201 S. College Ave. If you recognize these suspects please contact Bryan PD at 979-209-5300 or Crime Stoppers at 979-775-TIPS. Refer to Case #16-0800540. On 4/15/16 a theft occurred at the AT&T store on N. Harvey Mitchell. If you recognize this person of interest please contact Det. Stacey Nunn at 979-209-5318 or Crime Stoppers at 979-775-TIPS. Refer to Case #16-0400654. 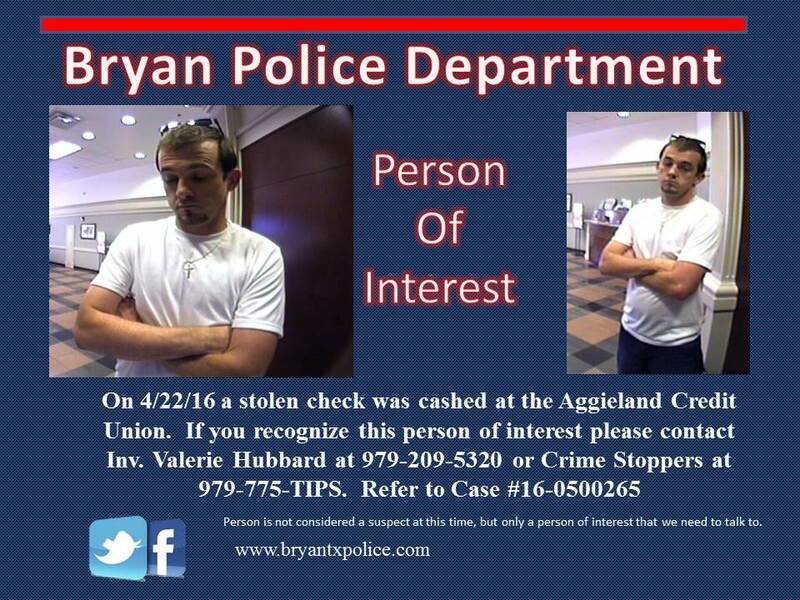 On 4/4/16 a stolen check was cashed at Aggieland Credit Union located at 2127 E. WJB in Bryan. This person is a person of interest and we need to talk with him. We are asking that if anyone recognizes him to contact Bryan PD Investigator Valerie Hubbard at 979-209-5320 or Crime Stoppers at 979-775-TIPS. On 2/2/16 several purchases were made with a stolen credit card at Targets in Bryan, College Station, and Roundrock. If you recognize these two individuals please contact Det. Miller at 979-209-5326 or Crime Stoppers at 979-775-TIPS. Refer to case #16-0400596. On 3/2/16 several charges were made on a stolen Credit Card. If you recognize this person of interest please contact Det. Matt Miller at 979-209-5326 or Crime Stoppers at 979-775-TIPS. Refer to case #16-0300831. On 4/19/16 at 2am two suspects entered the Fas Start on Hwy 21 and displayed a firearm. The suspects fled without making any demands or taking any property. If you recognize these suspects please contact Det. Fry at 979-209-5329 or Crime Stoppers at 979-775-TIPS. Refer to case #16-0400825. On 3/9/16 counterfeit money was used to make purchases at Walgreens on Boonville Rd. If you recognize these three persons of interest call Detective Miller at 979-209-5326 or Crime Stoppers at 979-775-TIPS. Refer to Case #16-0300392. On 7/28/15 a theft occurred at Game Stop. If you recognize this suspect please contact Investigator T. Balderas at 979-209-5310 or Crime Stoppers at 979-775-TIPS. Refer to Case#15-0701283. On 1/6/16 unauthorized credit card charges occurred at Krogers at 2303 Boonville Rd. If you recognized this person of interest please contact Investigator Valerie Hubbard 979-209-2320 or Crime Stoppers at 979-775-TIPS. Refer to case #16-0100946. On 11/20/15 two forgeries occurred at the Walmarts in Bryan. Two subjects drive up in a black truck with bed cover, silver running boards, and a sticker in the back window that reads www.DriveAllAmerican.com. This person of interest may have ties to the Tyler/Longview area. If you recognize this person please contact Detective M. Miller at 979-209-5326 or Crime Stoppers at 979-775-TIPS. Refer to case#15-1200668. On 9/14/15 a theft occurred at Walmart on Briarcrest. If you recognize this person of interest please call the Bryan PD at 979-209-5300 or Crime Stoppers at 979-775-TIPS. Refer to case #15-0900647. On March 11, 2015 a robbery occurred at the Shell Station located at 890 N. Harvey Mitchell Pkwy. If you recognize this person of interest please contact the Bryan Police Department at 979-209-5300 or Crime Stoppers at 979-775-TIPS. On April 20, 2014 at approximately 12:30am this suspect broke into the Exxon located at 3200 Boonville Rd and stole over $1000 worth of merchandise. If you recognize this person or have information regarding this case you are asked to contact the Bryan Police Department at 979-209-5354 or Crime Stoppers. Please refer to case #14-0400799. In early March 2014 a white female made purchases at various stores using counterfeit checks. The Bryan Police Department needs you help in identifying her. If you recognize this female call Investigative Assistant Valerie Hubbard at 979-209-5320 or Crimestoppers at 979-775-TIPS. She has also used these checks in College Station, Brenham, and Fairfield TX.